No tailwind component allowed on contaminated runways. Standby altimeters do not meet altimeter accuracy requirements of RVSM airspace. The maximum allowable in-flight difference between Captain and First Officer altitude displays for RVSM operations is 200 feet. Too many taxi, takeoff, landing & zero fuel limitations to list here. With engine bleed air switches ON, do not operate the air conditioning packs in HIGH for takeoff, approach or landing. Engine anti-ice must be on during all ground and flight operations when icing conditions exist or are anticipated, except during climb and cruise below -40°C SAT. Engine anti-ice must be on prior to and during descent in all icing conditions, including temperatures below -40°C SAT. Do not use wing anti-ice on the ground when the OAT is above 10C. Minimum N1 for operating in icing conditions except for landing: 40% when TAT between 0 and 10C; 55% when TAT below 0C; 70% in moderate to severe icing conditions when TAT below -6.5C. Window heat inop: max speed 250kts below 10,000ft. Gravel Protect switch: ANTI-ICE position when using engine inlet anti-ice. After any ground deicing/anti-icing of the horizontal stabilizer using Type II or Type IV fluids, airspeed must be limited to 270 KIAS until the crew has been informed that applicable maintenance procedures have been accomplished that would allow exceedance of 270 KIAS. Once the applicable maintenance procedures have been accomplished, exceeding 270 KIAS is permissible only until the next application of Type II or Type IV deicing/anti-icing fluids. Isolation and engine no. 2 bleed valves open. APU bleed valve may be open during engine start, but avoid engine power above idle. Use of autopilot not authorised for takeoff or landing. Do not use the autopilot roll channel above 30,000ft with yaw damper inoperative. Do not use autopilot pitch channel above 0.81M with hydraulic system A or B depressurised. Do not use ALT HOLD mode when Captain's alternate static source is selected. Use of aileron trim with autopilot engaged is prohibited. Do not engage the autopilot for takeoff below 1000ft AGL. For single channel operation, the autopilot shall not be engaged below 50ft AGL. Maximum and minimum glideslope angles are 3.25 degrees and 2.5 degrees respectively. Autoland capability may only be used with flaps 30 or 40 and both engines operative. Do not engage the autopilot for takeoff below 400ft AGL. For single channel operation during approach, the autopilot shall not remain engaged below 50ft AGL. The autopilot must be disengaged before the airplane descends more than 50 feet below the minimum descent altitude (MDA) unless it is coupled to an ILS glide slope and localizer or in the go-around mode. (JAA Rule).
. Tailwind: Varies between 0 and 15kts depending upon field elevation and flap setting. Do not use VHF-3 (if installed for voice communication) for ATC communications with ACARS operational.
. the message content may be frequently corrupted. However, Pre-Departure Clearance, Digital Automatic Terminal Information Service, Oceanic Clearances, Weight and Balance and Takeoff Data messages can be transmitted and received over ACARS if they are verified per approved operational procedures. Option - With HGS 4000 Phase I: AIII mode approach and landings are not approved for airplanes with Flight Dynamics Model 4000 Phase I HGS installed. With HGS 2350 and polar navigation: Do not use HUD System at latitudes greater than 85 degrees latitude or when the Heading Reference Switch is in the TRUE position. In flight, do not extend speedbrake lever beyond FLIGHT DETENT. Do not deploy the speedbrakes in flight at radio altitudes less than 1,000ft. 737-6/900 without stiffened elevator tabs: Do not operate the airplane at speeds in excess of 300 KIAS with speedbrakes extended. WARNING: Use of speedbrakes at speeds in excess of 320 KIAS could result in a severe vibration, which, in turn, could cause extreme damage to the horizontal stabilizer. Do not operate weather radar near fuel spills or within 15 feet of people. Air Data Inertial Reference Unit: ADIRU alignment must not be attempted at latitudes greater than 78 degrees 15 minutes. The use of LNAV or VNAV with QFE selected is prohibited. FMC U7.2 or earlier: During VOR approaches, one pilot must have raw data from the VOR associated with the approach displayed on the EHSI VOR/ILS mode no later than the final approach fix. 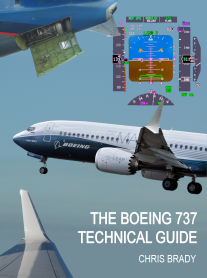 737NG Only: Use of the vertical situation display during QFE operation is prohibited. Greater allowance given for unsymmetrical loads in cargo version. Minimum of 760kg fuel required in respective tank for hydraulic pump operation. Minimum of 88% required for despatch. Do not apply brakes until after touchdown. Operation with assumed temperature reduced takeoff thrust is not permitted with anti-skid inoperative. Do not use the PDCS information unless the engine configuration displayed on the PDCS is the same as the engine configuration of the airplane. Fuel management and range calculations presented by the PDCS have not been evaluated by the FAA. Verify that the representative takeoff EPR limits displayed on the CDU and EPR indicators agree with the predetermined limits obtained from the flight manual. CFM56-7 limits: Maximum and minimum limits are red. Caution limits are amber. Engine ignition must be on for: Takeoff, Landing, Operation in heavy rain and Anti-ice operation. Intentional selection of reverse thrust in flight is prohibited. Note 1. Different (reduced) x-wind guidelines are available for 30m wide runways. Dry snow 60mm NB Above -5°C snow is to be considered as slush.